Thank you for your interest in 1 Lombard Street! 1 Lombard Street is the Square Mile’s most established restaurant and arguably it’s best placed, sited next to Mansion House, the official residence of the Lord Mayor of London, and directly opposite the Bank of England. Housed in a former Grade II-listed bank, it was opened in 1998 by former banker Soren Jessen and comprises a restaurant, brasserie, bar, private dining and events rooms. It is where the City meets for breakfast, lunch and dinner, launches new businesses, signs deals and celebrates profits. And it’s even where the City gets married. 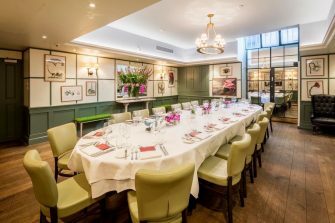 1 Lombard Street is a popular venue for private dinners, launches and parties, and is available for exclusive hire (up to 200 seated or canapé receptions for up to 450 guests), with more intimate functions hosted in the new refurbished Botanical private dining room that can seat up to 40 guests. .